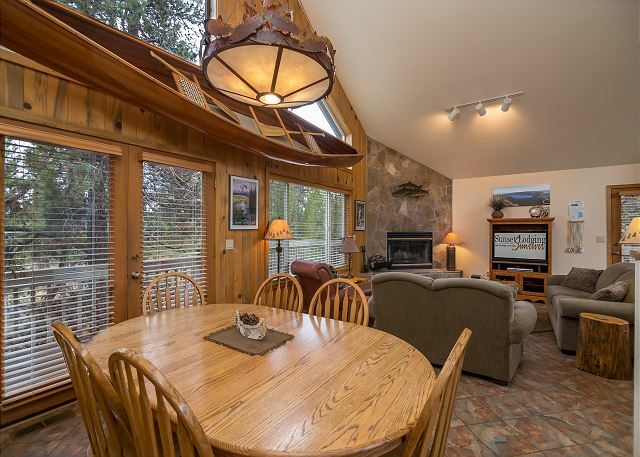 Pyramid Lane #5 is an impressive, reverse living 3 bedroom vacation home perfect for up to 8 guests! 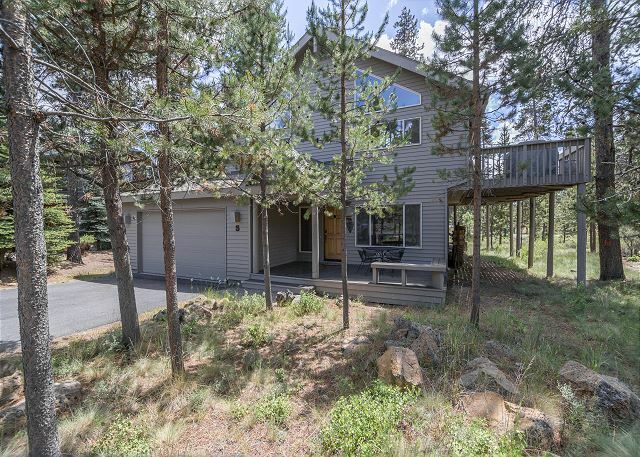 This recently updated home, is located on the North End of the Resort, with Brand New Air Conditioning, 6 bikes, and expansive decking space and deck furniture! The front door entry to the home, leads into the lower level family room. 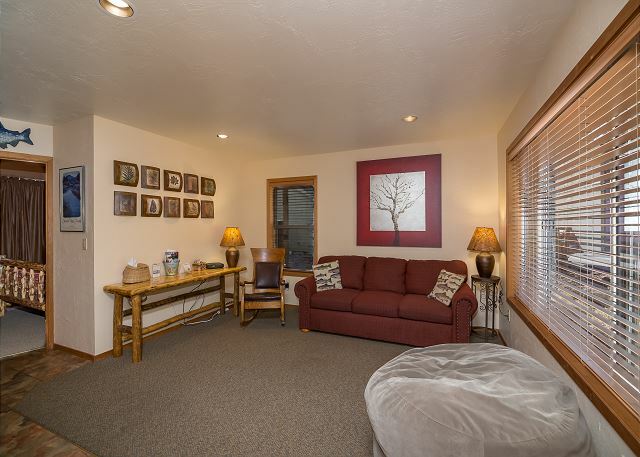 This room is supplied with a couch and TV entertainment center. Utilize the family room for extra living space that includes a Queen Hide-a-Bed. The family room has stairs leading to the upper level main living space. You will also find 2 bedrooms downstairs. 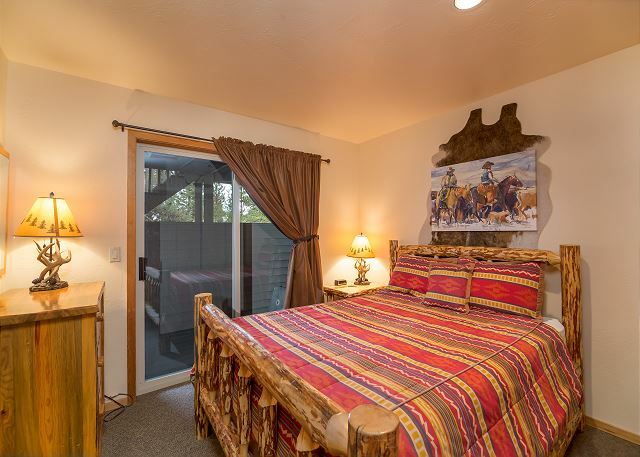 The first bedroom downstairs, has a modern rustic, log style Queen bed and the second bedroom downstairs is furnished with a double bed and a set of bunks. Both bedrooms have direct sliding door access to the lower level patio area. There is an updated common bath downstairs as well. The lower level patio is complete with a private Hot Tub and privacy wall. 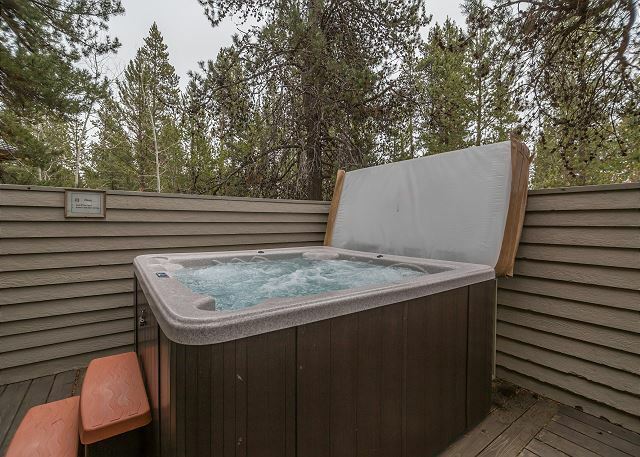 The hot tub is perfect for soaking after a long day on the slopes at nearby Mt. Bachelor, or after a full day of floating the river, or exploring one of the many lakes or walking trails nearby....ALL easily accessed from the home. The very open, upper living area has vaulted ceilings and soaring windows, and lots of natural light! 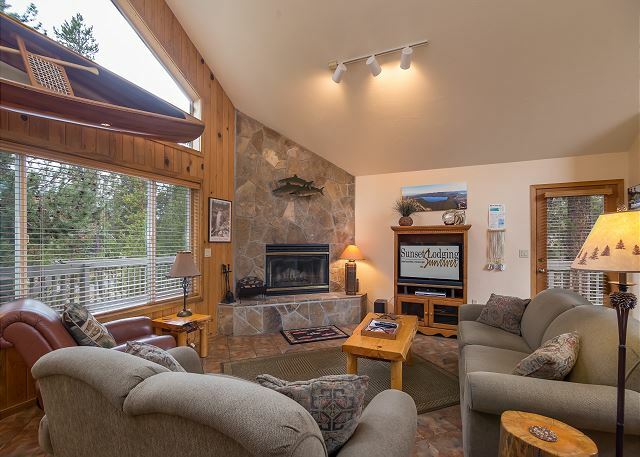 Pyramid 5 lends itself to be the perfect spot to relax and enjoy the beautiful views Sunriver offers, bringing the outdoors in. Catch a game, or watch a movie on the flat screen TV, with included cable...or just cozy up on one of the comfy couches and catch up on that book you've been meaning to read. 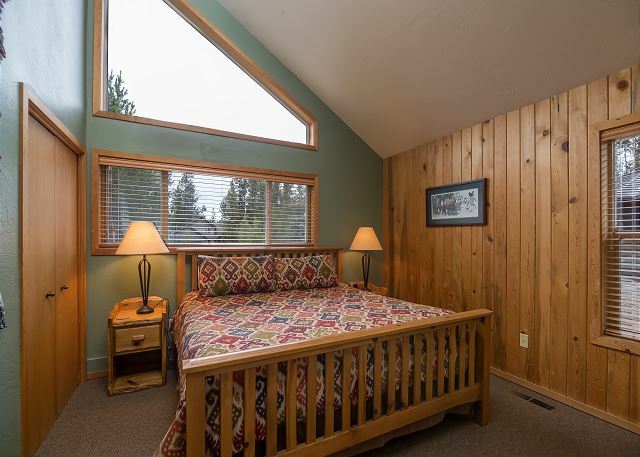 The tasteful decor and comfortable furnishings, with hard surface flooring make Pyramid 5 the perfect getaway in Sunriver! 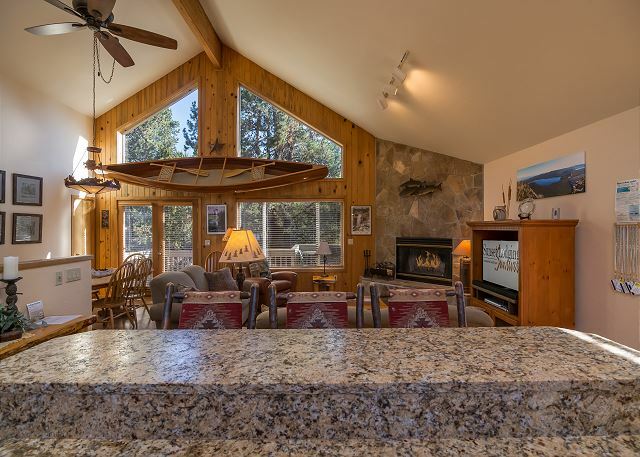 Curl up in front of the impressive stone fireplace with bench seat ledge, and enjoy the ambiance it provides while enjoying a beverage...perhaps a craft beer that Central Oregon is known for, or a cup of hot cocoa to unwind! 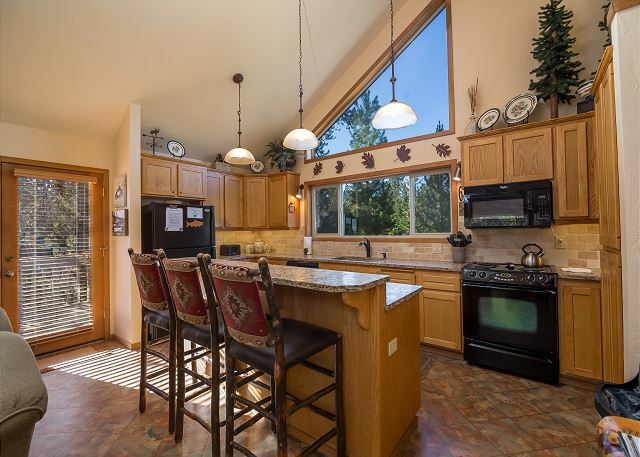 The fully stocked, and recently remodeled kitchen overlooks the main living area, and open dining space. The kitchen is equipped with brand new granite counter tops with ample counter space, and a large island bar with brand new accent lighting to highlight the updates! The kitchen also features an updated, subway style stone back splash. The generous cabinet space makes storing your items and preparing meals a cinch! The large window above the kitchen sink even makes cleaning up enjoyable! The gorgeous granite island bar seats 3 comfortably, with 6 more seats available at the separate dining table, nearby. 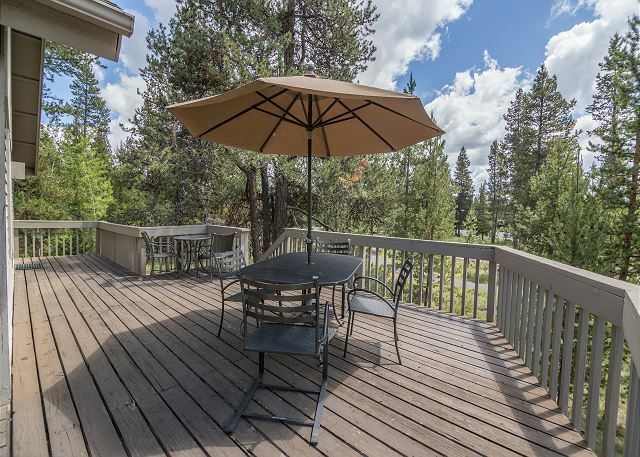 The massive decks are perfect for grilling outside during the day, watching widlife or stargazing under a blanket at night! 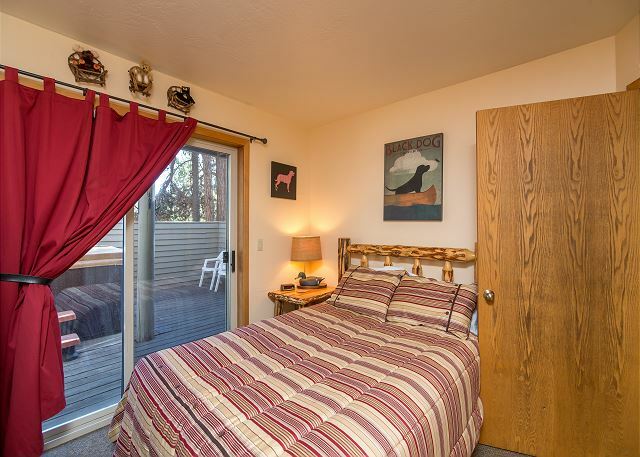 The master bedroom upstairs, provides a king bed and personal updated bathroom. 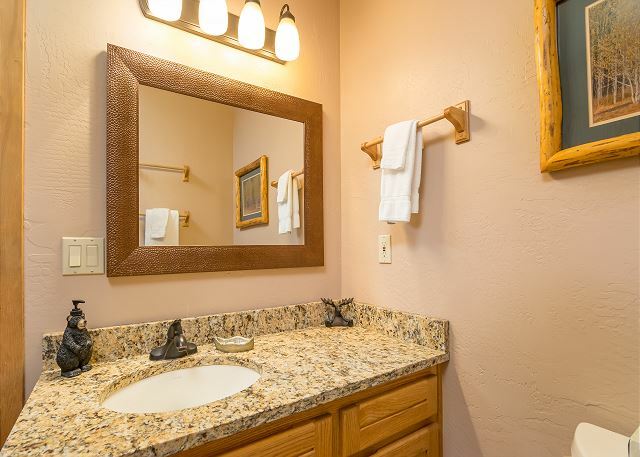 The master bathroom has also been remodeled to include double vanity sinks and granite counter tops fitted with over sized, oil rubbed bronze mirrors and light fixtures. This bathroom has it all. It's large enough to make getting ready a painless task for 2, with enough space to store your items effortlessly. Take one of the 6 included bikes and ride over 33 miles of paved bike paths easily accessed from the home. The North Store is a full service grocery store, with gas station, liquor store and post office and offers movie rentals as well. It is conveniently located just a few short minutes away by bike, or on foot! Grab one of the 8 SHARC PASSES for fun in the sun, or enjoy the heated indoor pools and Hot Tubs in the winter months.The passes can be utilized for disc golf, tennis/pickleball or Free Marina parking! 3 Bedroom/2 Bath - 1 King, 1 Queen, 1 Double, 1 Set of bunks, 1 Queen Hide-A-Bed, New A/C, 2TVs, DVD player, D/W, W/D, microwave, fireplace, HOT TUB, large deck, gas BBQ, reverse living, 6 bikes, garage 552 sq ft, house 1627 sq ft.
We're glad you enjoyed your annual vacation at Pyramid #5! We can't wait to have you stay with us again in the future. Thank you for your review Dennis, we're happy you enjoyed your stay in Sun River at Pyramid #5. We hope to see you again next summer! 1 week is not enough ! We shared the rental with another family. 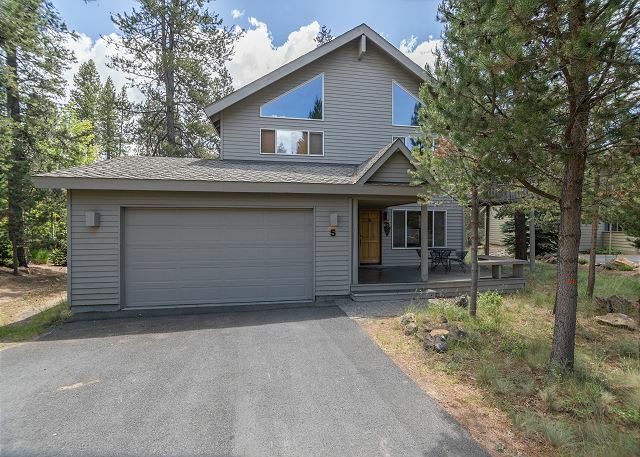 Sunriver/Bend area and this house has something for everyone. The kitchen we discovered was over the top in finding any utensil or serving bowl and small appliance needed. 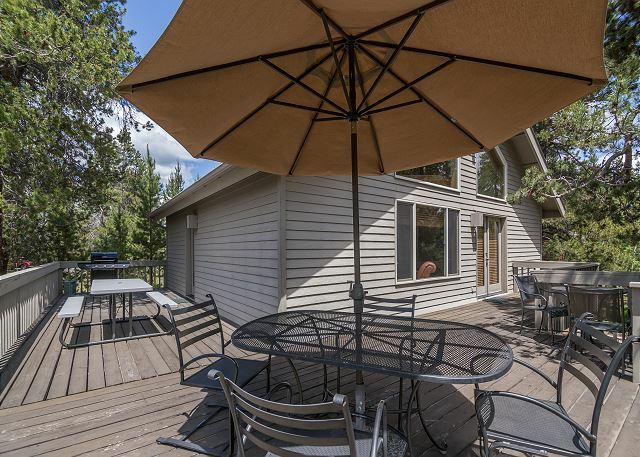 We divvyed up meals between families We loved the location at then North End of Sunriver. Coming from such a congested city in California we felt we owned the cul-de-sac it was so peaceful! The house does come with bikes that work around - but some of us brought our own since we wanted to take on more serious riding. Access by foot on the paths or bike were fantastic. Most of the time we did some family group activity (Hiking, River Rafting, Lava Cave, High Desert Museum, etc) and then split up either hanging at the house reading, watching a movie (we brought some DVD's), hot tubbing, playing games (they have some but bring your favorite just to be safe). Then there is the SHARC. Kids comments "SHARC is THE BEST" - we barely touched the surface of what you can do here. A week is not enough. We'll certainly be back. We can't wait to see you again, Hilary! And this feedback just makes us feel so good. It's why we do what we do. We hope to have the privilege to host you for many years to come. Thanks for your kind words and hurry back to Sunriver, we'll keep the place sunny and beautiful for you in the meantime! Our first trip to Sunriver was this past summer. We loved it so much, we couldn't wait to come back, Pyramid #5 is a perfect place for our family. It feels like home. We love being able to walk to the store. We had a great stay. The house worked out perfectly for our family vacation. We would definitely stay again. Sunriver has a great setup. Our family with 6 kids aged 8-14 had a wonderful vacation at Sunriver and Pyramid #5 was perfect for us. Enough room for everyone to sleep and very comfortable. We didn't feel we were lacking anything. The location was great for us, easy walking distance to the north store. There was something for everyone, we enjoyed several trips to the SHARC, horse rides, rocket making and great sight seeing. We are ready to go back! This is SO good to hear, Sandy!!! And thank you for this valuable feedback. We *truly* believe that supplying our visiting families with the best value vacation is our mission and hearing that those efforts paid off is really great. We'd like to be the Harris Family vacation spot for years and years to come, so hurry back! We'll keep the place sunny and beautiful for you in the meantime. The house was great. We loved the reverse layout with the living area upstairs. We also liked how close it was to the north store. Our only complaint is that the decision by the SRHO to close the north pool to renters was a disappointing decision and made the SHARC very crowded. We get a lot of this sentiment about the North Pool (and crowded SHARC), Scott. And while we are elated with 'the fix' that the SROA came up with so that more guests could utilize the SHARC, we share the disappointment about the North Pool. We hope to have the chance to host you again. We always have a wonderful time in Sunriver! Sunset Realty is the only place we rent through now for years. We stayed in this home once before. It is very comfortable and very well equipped for cooking and baking. The kitchen is excellent and has a nice view while you cook and clean dishes. 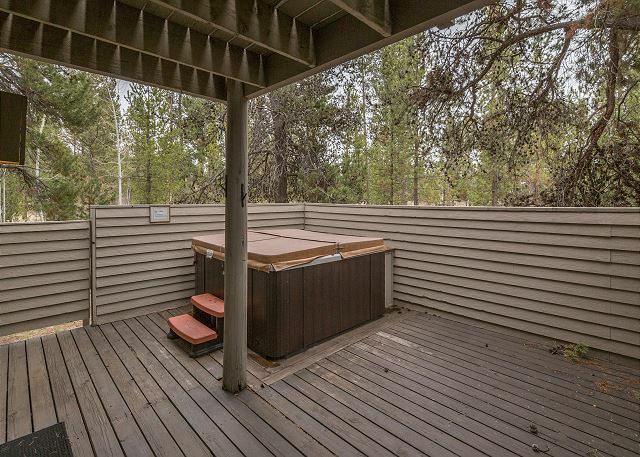 The hot tub is very private and you walk right into the bathroom to rinse off! We have been to Sunriver several times...but this time was the best! We have a large family that has now grown...two grandchildren! We wanted a place to stay that could accommodate several people and also be safe for the little ones (both are 1 yr. old).Pyramid #5 was perfect. The upper level has a large kitchen (big enough for all of us to cook together) and a family room where we were all able to "hang out"...visit or watch a movie. The babies (and parents) slept downstairs, so we didn't have worry about being quiet in the mornings, during naptimes, or in the later evenings. There are steep stairs to the lower level, but baby gates were available. 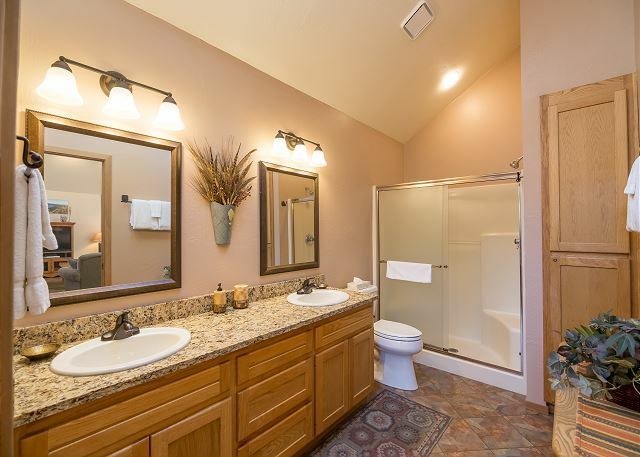 The upstairs bathroom and master suite were so lovely and very comfortable for the "! :) We were surprised by the location - the Mavericks center (pool, exercise equipment, etc.) was literally in our back yard! We could walk there whenever we wanted. Biking from this location was also fantastic. The ride to the North Pool and nearby park were just the right length for the whole family to participate. We brought some of our own bikes, but the place was also equipped with more (in good running condition). We are still talking about how much we enjoyed our stay!